Corporate and business gift baskets are shipped from Ashville, Ohio. Our gift baskets are a great way to thank customers, business to business appreciation gifts, referral gifts and employee recognition gifts, just to name a few. 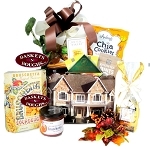 In addition to our large selection of gift baskets, we feature a lovely selection of foods made in the Ohio area. Call us for your Business or Corporate Holiday Gifting!! We also can customize gift baskets and include your business promotional items, to create giveaways for special events, such as trade shows, conventions, conferences, meetings, and silent auctions. Have your logo printed on the ribbon! Just email logo in a jpg file to see if it will be printable with our ribbon print platform. To include a message with your gift basket, type it in the comment section located at the bottom of the checkout page. The message will be added on a themed hang tag before shipping.